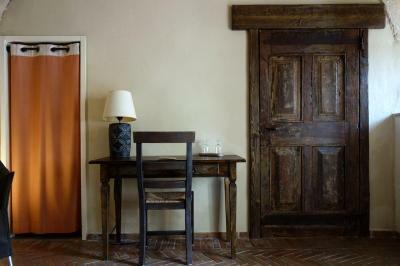 Lock in a great price for Locanda Di San Martino Hotel & Thermae Romanae – rated 8.9 by recent guests! Good breakfast, comfortable room and pleasant staff. A bit difficulty to find. 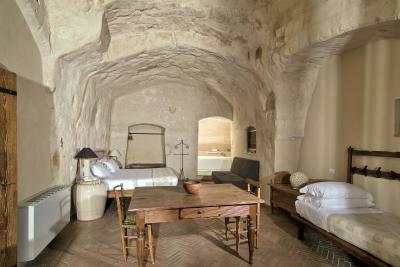 The property was in the heart of Matera and it was awesome! 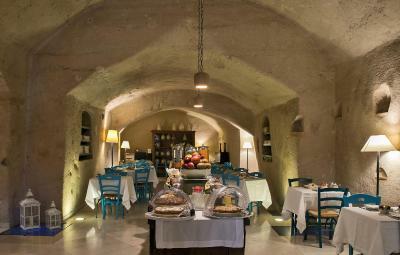 Rooms were very good inside a sassi. Breakfast was great. Staff were helpful. Spa pool is fantastic. Rooms and furnishing really in keeping with the place. Friendly staff. If you are driving like us, you can drive to the hotel to drop off the luggage before driving back to the parking. No one told me this when I called for parking instructions. So we had to drag our luggage through the stairs from the parking. Right in the center of the historical old town. Clean and comfortable room. The gym and swimming pool looks amazing. Great breakfast choices. The breakfast was great. The staff was very helpful with suggestions for places to visit and helping us arrange a rental car pickup. The apartment was unique and beautiful and spacious. 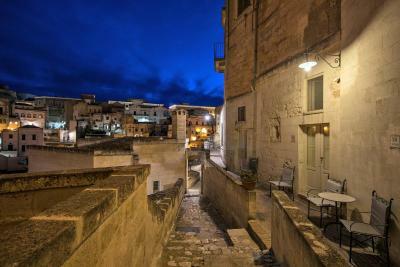 Matera and the Locanda Di San Marino were definite highlights of our trip to Italy. 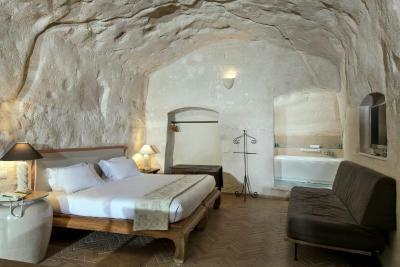 The hotel was in a great location and indeed the pictures on the internet verify its authentic cave-like room. My only disappointment was the fact that the view from our window was obstructed by a stone wall. 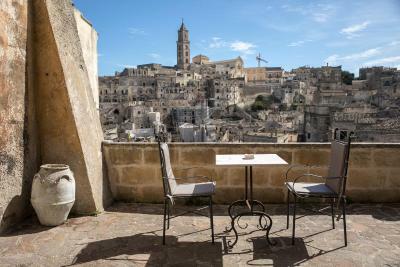 Matera is a sight to behold and I would have liked to see the view from our window and terrace. Breakfast was excellent with a mixture of local products that were delicious! The location is good. The room was lovely. Breakfast was nice. The staff were always pleasant. 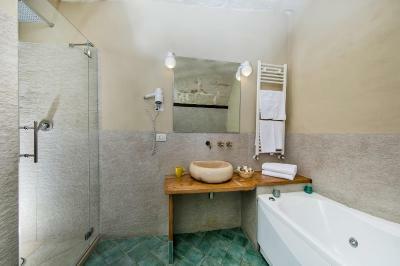 Locanda Di San Martino Hotel & Thermae Romanae This rating is a reflection of how the property compares to the industry standard when it comes to price, facilities and services available. It's based on a self-evaluation by the property. Use this rating to help choose your stay! 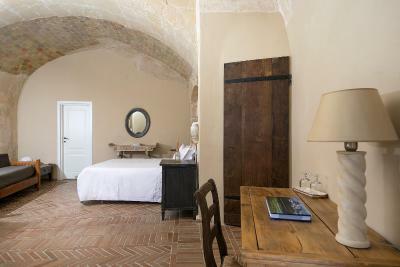 Locanda Di San Martino is set inside the Matera Sassi UNESCO World Heritage site. It offers traditional accommodations carved out of the rock, plus a hydromassage indoor swimming pool. WiFi is free throughout. 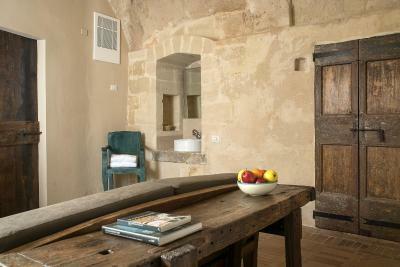 All rooms and suites feature wooden furniture, vaulted ceilings and a furnished balcony with views of the old town. 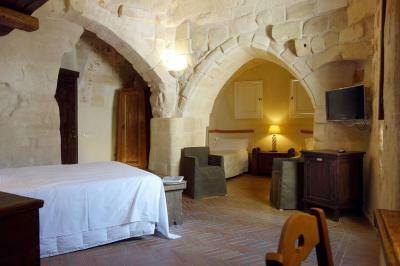 Each room has air conditioned and a satellite TV. 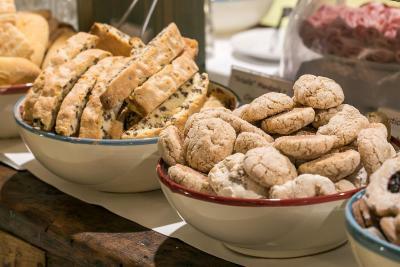 Breakfast includes a buffet of freshly baked food and delicious Italian cappuccino. An indoor pool with hydromassage, sauna and Turkish bath are included in the Therme wellness center, which is available to guests over 18 years of age. 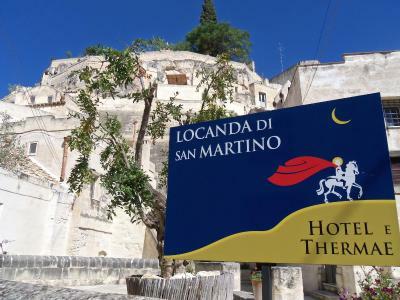 Locanda Di San Martino Hotel & Therme is a 10-minute walk from Matera Train Station. 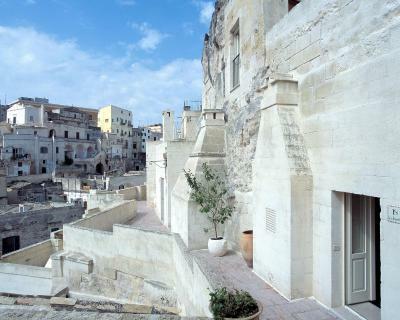 Matera Cathedral is 1,300 feet away. Guests can enjoy discounted rates at a nearby partner car park. 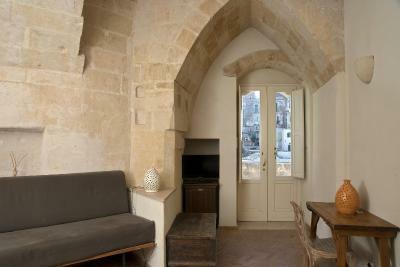 This is our guests' favorite part of Matera, according to independent reviews. 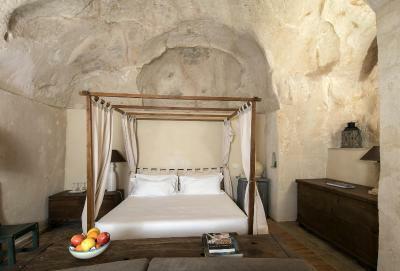 When would you like to stay at Locanda Di San Martino Hotel & Thermae Romanae? 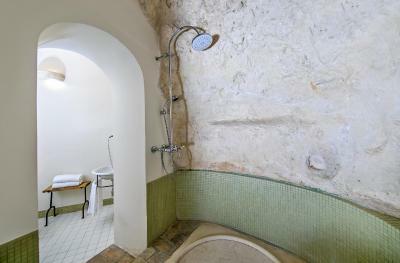 Offering access to a shared terrace with views of the Matera Sassi UNESCO World Heritage site, this room with attached bathroom offers free WiFi, air conditioning and satellite TV. 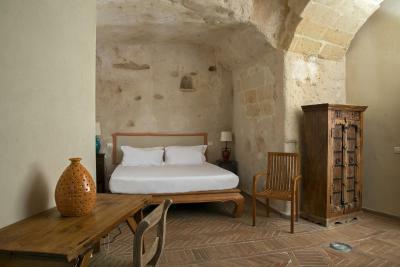 A spacious junior suite with tiled floors. Offers free WiFi, air conditioning, and satellite TV. 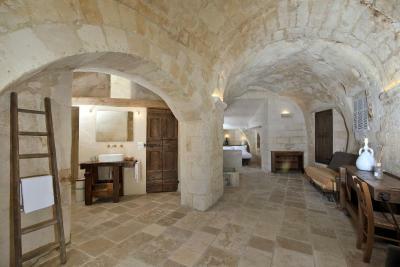 Some rooms include a spa bath. 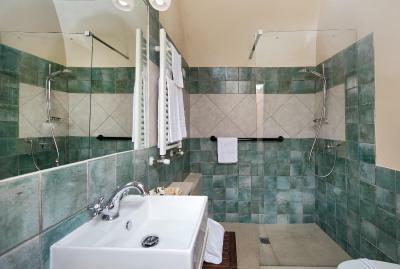 Large suite with a spa bath and tiled floors. 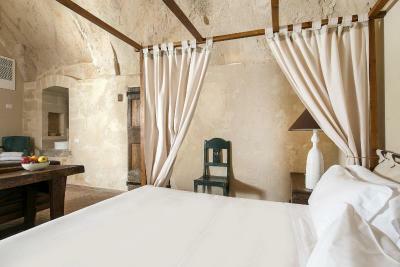 Offers free WiFi, air conditioning, and a flat-screen TV with satellite channels. 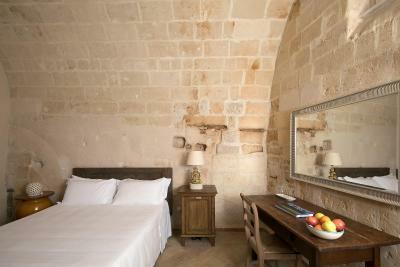 This room comes with free WiFi, satellite TV and a private bathroom. 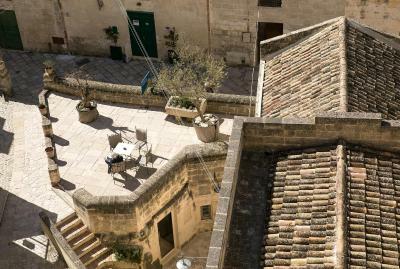 Offering access to a shared terrace with views of the Matera Sassi UNESCO World Heritage site, this air-conditioned room has a satellite TV, private bathroom and free WiFi. 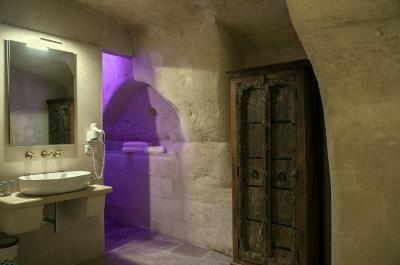 This air-conditioned room features a satellite TV, private bathroom and free WiFi. 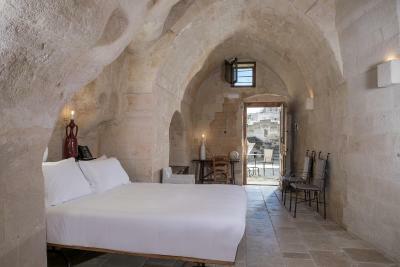 Featuring exposed stone walls and an arch, this air-conditioned room features free WiFi, a satellite TV, and a private bathroom. 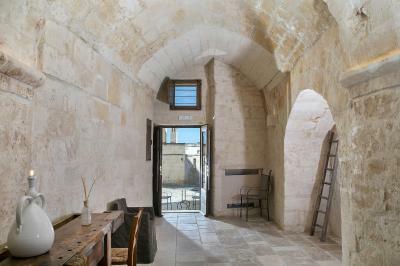 Located 820 feet from the main building and reached by stairs, this room offers either a private or shared terrace with views of the Sassi di Matera UNESCO World Heritage Site. Includes free WiFi, air conditioning, and satellite TV. 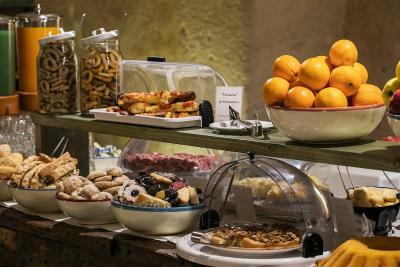 Check-in and check-out take place in the main building, where both the breakfast room and the Therme Romanae are set. 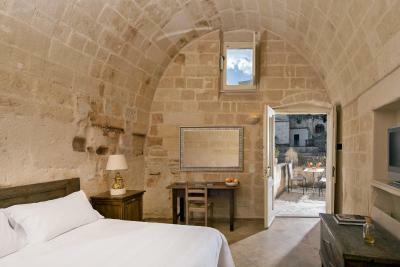 Located 820 feet from the main building and reached by stairs, this suite features a spa bath and a shared terrace with views of the Sassi di Matera UNESCO World Heritage site. Includes free WiFi, air conditioning, and satellite TV. 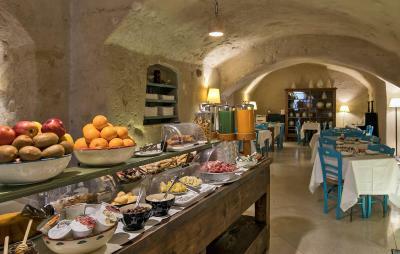 Check-in and check-out take place in the main building, where both the breakfast room and the Therme Romanaeare are set. Located 246 feet from the main building, this split-level apartment with free WiFi has a private entrance, a kitchen, a living room and a raised sleeping area. Set 246 feet from the main building, this split-level apartment has a private entrance, a kitchenette, and a raised sleeping area. 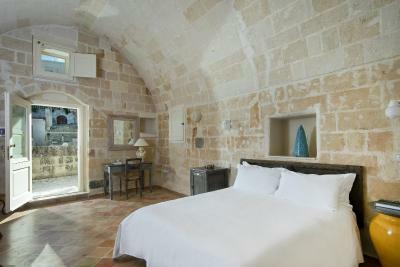 Includes free wifi and air conditioning. 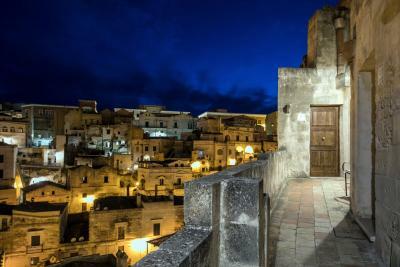 Matera’s old town is an amazing network of cave houses, known as "sassi". 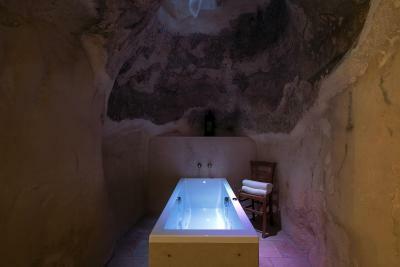 Bars, restaurants and hotels are built into the limestone rock face and you can take a walk through uninhabited caves. 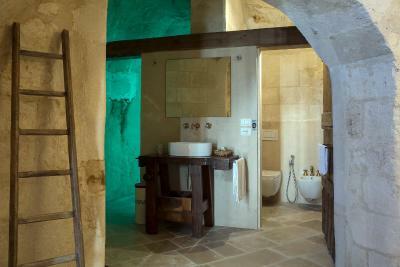 House Rules Locanda Di San Martino Hotel & Thermae Romanae takes special requests – add in the next step! One child under 2 years is charged EUR 10 per person per night in a crib. Locanda Di San Martino Hotel &amp; Thermae Romanae accepts these cards and reserves the right to temporarily hold an amount prior to arrival. Locanda Di San Martino Hotel & Thermae Romanae accepts these cards and reserves the right to temporarily hold an amount prior to arrival. 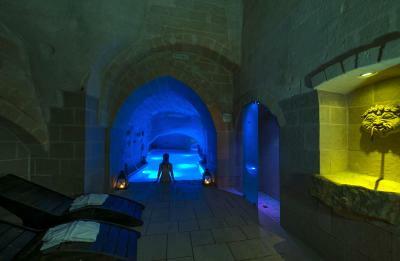 The Therme wellness area is available at an extra cost. Please note that children under 18 years old cannot access the wellness area. Please note that this property is set in a restricted traffic area. Access by car is allowed for loading and unloading of luggage only, and for a limited time. 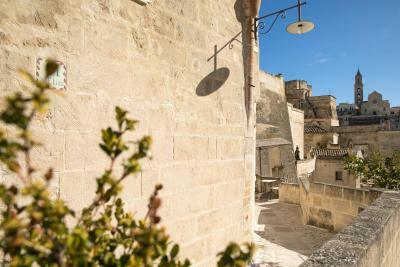 One of the most picturesque neighborhoods in Matera! 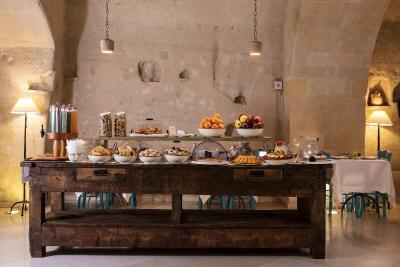 The location is very nice, the swimming pool is astonishing and the breakfast was very good. The spa area was amazing. Nothing to report, except the medieval, 2 inches thick door of our bathroom would appreciate some lubrication (WD40 or other) to stay silent when opened at night ! - just a joke. 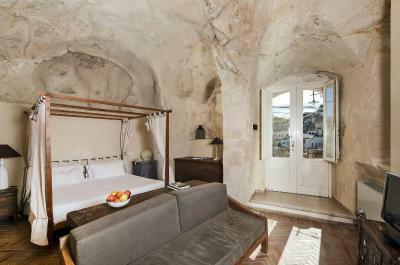 The hotel benefits from a unique location at the earth of the Barisano Sassi, with unique views on the Old City from the rooms themselves. Breakfeast was perfect, in a splendid room and with live piano music. 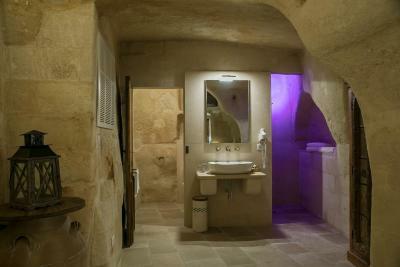 Thermae inside the hotel facilities are a very welcome bonus, at a reasonnable additional fee. The reception staff were not particularly friendly nor helpful. 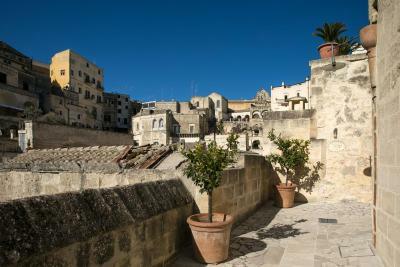 It is not easy to find anything in Matera so we called when we were on our way. The member of staff told us to call when we arrive at a certain point at Matera and he would guide us to where we need to be. I think we called about 4 times and no one ever answered. The welcome was not much more pleasant when we did stumble upon it. It would have also been nice to have been told that there was another exit from the hotel to get into town as well rather than having to find out from someone in a shop. Also the spa is lovely but the need to limit the number who can go at any time even more than they currently do. It was too crowded and hard to find a place to sit. Great location and the hotel in general is done very well. The bed was very comfortable and the place is super quiet so sleeping was ideal. Breakfast was very good and the staff at breakfast were attentive. breakfast was good, the location is perfect. 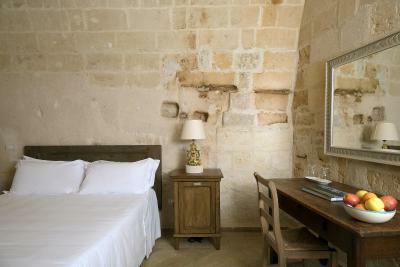 The bed was very uncomfortable, quite small and basic, consequently a very poor nights sleep. 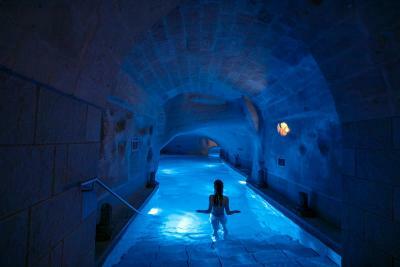 The thermal Spa was lovely, really warm and comfortable, a unique experience. The lighting in the room was very dim. Understandable given that the room was a cave, but a comfortable pair of chairs with a good reading light would have been nice. It was also quite cold in the room, I slept with a sweater on as I woke up cold the first night. The bar area sofas could be better, they look well but need a few cushions to make sitting in them comfortable. Apart from two people the staff on the desk were not very friendly and information had to be dragged out of them. 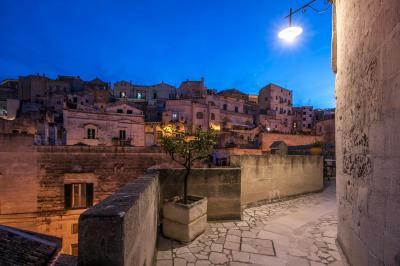 We were not offered suggestions on interesting things to see in Matera and good restaurants to eat in, this would be helpful especially on our first night. 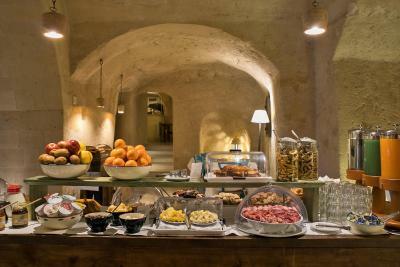 The breakfast was good and the staff at breakfast were very helpful. They did their job well but lacked warmth and welcome. There was a bit of "take it or leave it" attitude. In the evening after a long day sight seeing we had to search for someone to ask for a glass of wine at the bar, we finally got a very good red with little crackers and peanuts, these were a nice touch as they were not expected. The women running the SPA were very pleasant and helpful. The location of the hotel is just perfect. Right at Sassi. The thermae was just so good after a long day. A must do! Love love this place. There is nothing I didn’t like about the property. Room 3 very warm even in March. 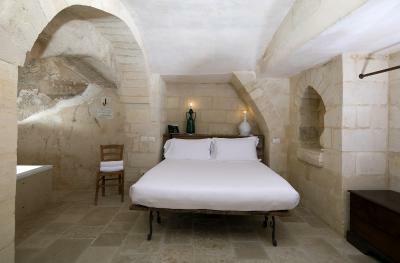 Very comfortable room, bed and shower. Right in the heart of the Sassi but only a short walk downstairs from the main square & bus terminal (the Sassi is hard to navigate with baggage). Breakfast is AMAZING!! 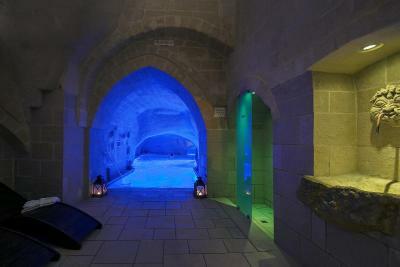 Staff were friendly and the Thermae was relaxing though I was lucky it was quiet.